Old school: a ham salad sandwich at Arthur's. London has some fantastic sandwiches but the choice can be overwhelming. Avoid the sub-standard shops with their crusty chicken tikka mayo and wan baguettes, and head straight to one of these east London treasures. 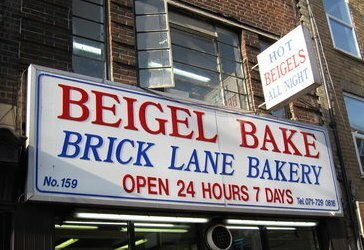 We’ve all stood outside this London institution in the wee hours, enthusiastically chewing a bagel while trying to talk to our mates at the same time. The salt beef comes in thick wadges, the mustard in nose-clearing swipes and the pickles, fat and floppy. Unusually for us, we prefer this one without the pickle. We never thought we’d say it but it’s true. They bake 2-3K beigels a week, here and it's rare that you'll enter and not join a line snaking around the shop. You can see the full article on this E1 bakery's secrets here. This popular spot in Victoria Park can get busy, particularly at weekends, but it's worth fighting for a spot. 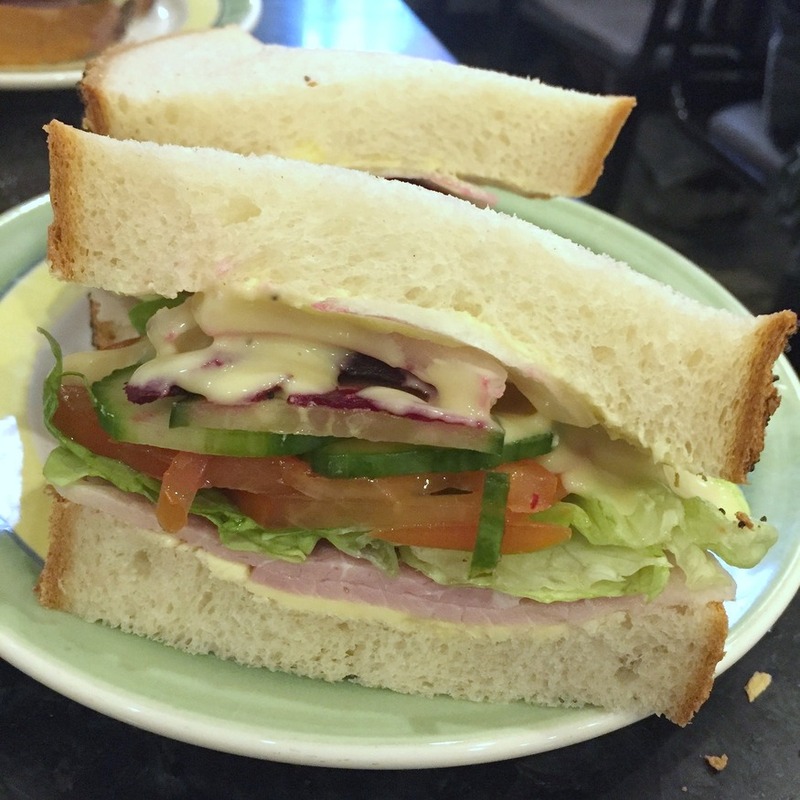 Their sandwiches are great in general, and we never miss the ham hock, mayo and crunchy salad when it's on the menu. They really excel at breakfast however, and their bacon sandwiches are very good, packing Ginger Pig dry cured bacon and egg, or BLTs with aioli. They bake their own bread, so it's always fresh and great quality, although if you're not a fan of sourdough for sandwiches, then be aware that this is all they use. Finally, there's a twist, which is that the founder started the business selling tea at Borough Market after an inspiring trip to Sri Lanka, so you can also order breakfast hoppers, like lacy, bowl shaped pancakes, with various chutneys and bits on the side. This Bethnal Green pub only has one thing on their food menu. 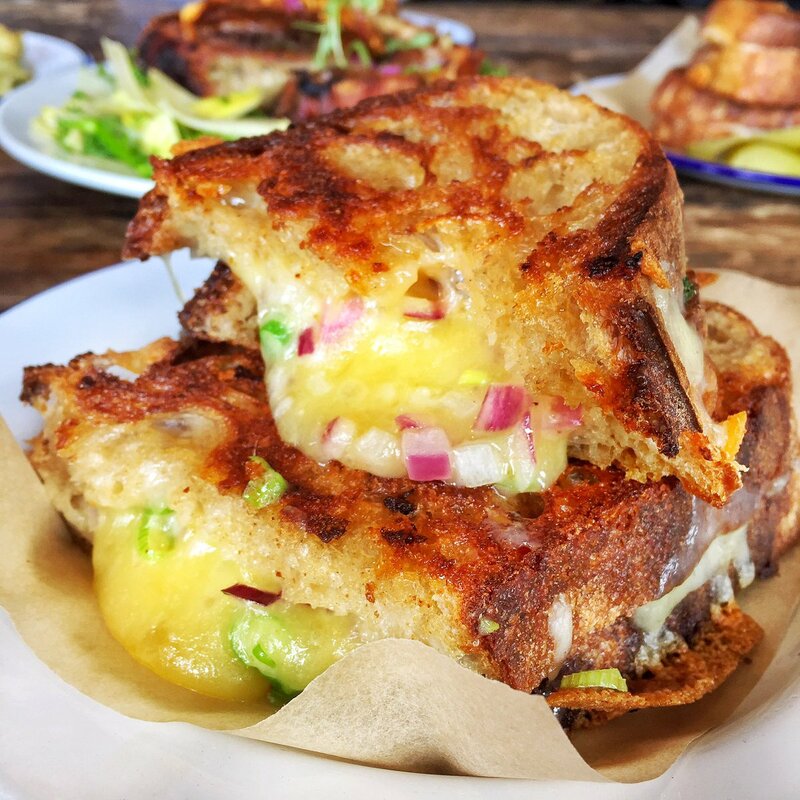 But what a thing... Their cheddar, spring onion and truffle oil toastie is straight-up, melting cheese-filled beauty. Thoroughly filling, piping hot and ideal for pre-gaming or refuelling in the middle of a night out. 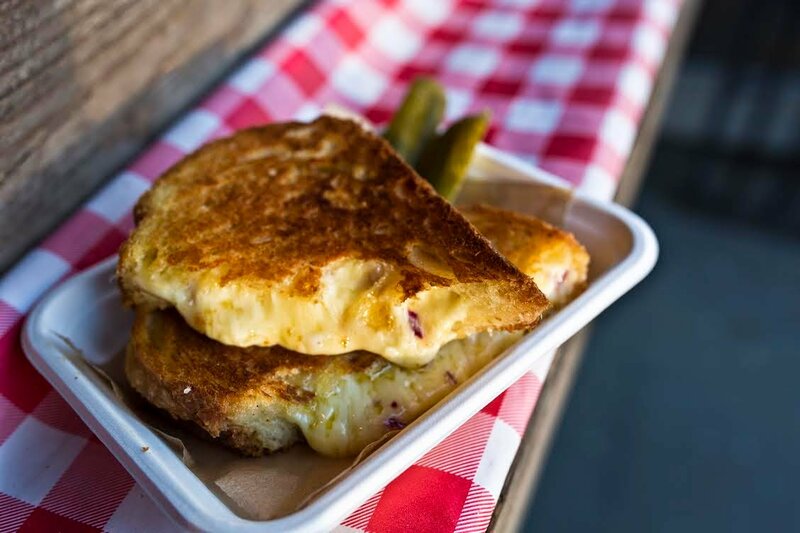 Comes with a good, generous slab of gherkin on the side, as all cheese and cheese-centric dishes should. There's a big focus on local and London-made produce at this Hackney deli, and they increasingly make as much as they can in their own kitchen. We're always wowed by the gorgeous black and white tiled floor and never fail to get waylaid by the central display of baked goods, stacked with homemade cakes, breads and savoury goodies like scotch eggs. The sandwiches change regularly but are always brilliant, and there's quite a range. We love the rare roast beef with horseradish cream, and they also manage to make a festive sandwich at Christmas that actually tastes nice. Sandwich sorcery. This east London institution makes a mean sarnie, and there'll be none of your fancy garnishes or sourdough. Run by husband and wife team, Arthur and Eileen, it's very traditional -- the kind of place we hope always exists in London. This is basic British cafeteria food, except they cook most things themselves, including the ham for the sandwiches. We loved our ham sandwich on the softest white bread with salad and -- gasp! -- a choice of mayo or salad cream. We took both and went half and half. Salad is so old school it comes with sliced beetroot. A trip to the loo is an adventure, taking you through the kitchen with its oily floor, to a single toilet out back. In the kitchen you'll pass Eileen, hunched over but perfectly capable as she moves between the pots and pans, calmly knocking out lunch for a full caff. 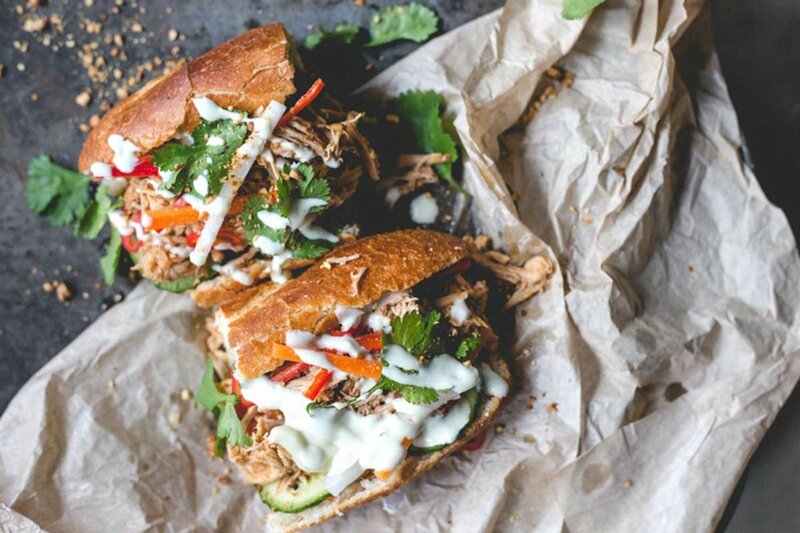 We think that Banh Mi Hoi-An make the best banh mi in London right now. The baguettes are light and crisp, the pickled veg just the right balance of sweet and sour and the chilli and herbs full on. We love the roast pork belly but the tofu is great too, packing a decent whack of lemongrass. They're not shy with the flavours and everything is very fresh. That point sounds silly -- everything should be fresh, right? -- well it's amazing how many banh mi joints fall down on this detail. There's always a bit of each flavour in every bite, too. Just really great banh mi. Morty and Bob's is a gorgeous, light, plant-filled place that feels part café, part jungle or crazy aunt's conservatory. They're famous for their cheese toasties, which are definitely worth your money, particularly the croque madame -- a croque monsieur with a fried egg on top. It's golden, with a coating of dangerously hot bubbling bechamel, and an inner layer of ham and cheese. It's a knife and fork job, obviously, so cut her open and let that steam rise. Every moment that passes is a moment closer to croque 'o clock. 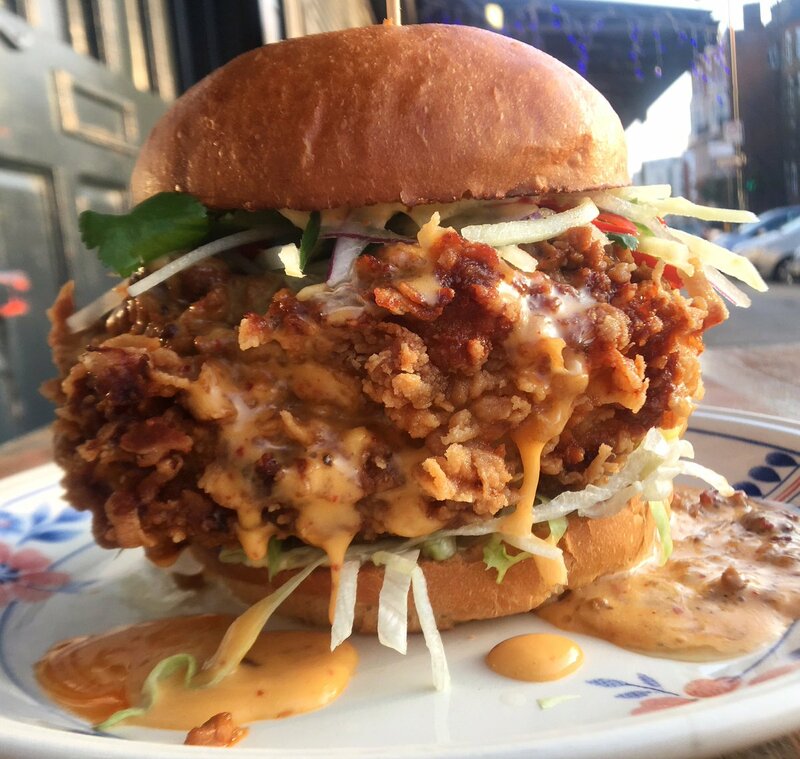 The brunch sandwich at Chick 'n' Sours is a craggy fried chicken filled masterpiece. It's also massive. This place is really, reallly good at frying chicken, to the point where they also do a whole fried chicken on Sundays. Do you know how hard it is to get that right? It's very hard. Anyway, the sandwich comes with a much more manageable piece of chicken, plus technicolour slaw and gochujang mayo -- that's mayo with Korean fermented chilli paste, and it's just about the most incredible spice paste ever. The only problem with this is trying to fit the darn thing in your mouth. 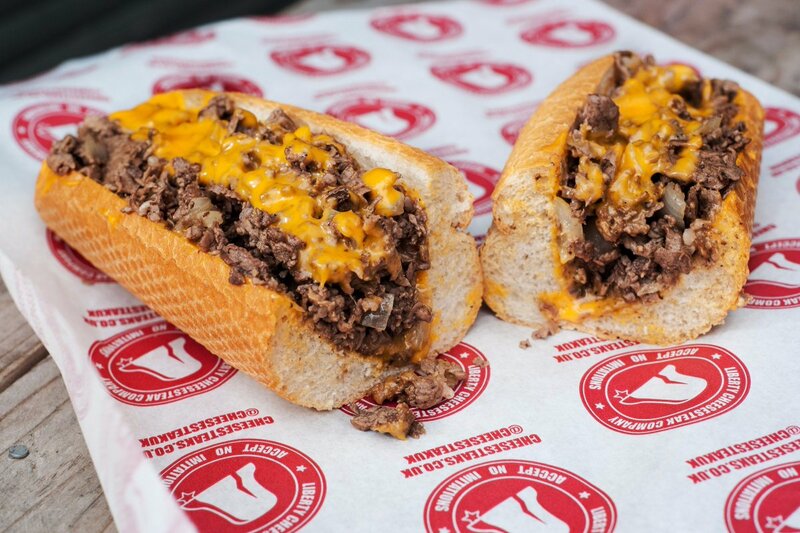 There’s only one really great cheesesteak in London and that’s from The Liberty Cheesesteak Company, where you can get your teeth into authentic Philly-style (definitely no peppers) soft sub rolls, thinly sliced rib eye and Cheez Whiz for the brave (always get the Cheese Whiz). 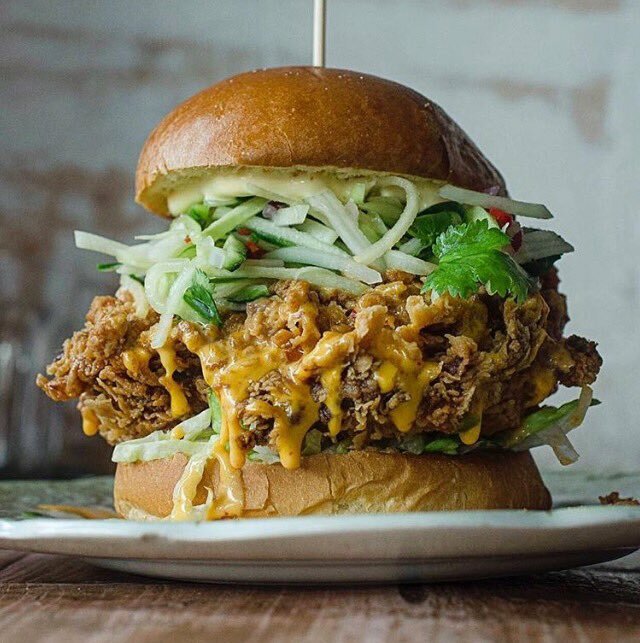 It's so good it made it onto the list of our 100 favourite sandwiches in London. Yolk have been bouncing around residencies in east London for a while, gathering a following for their eggs - still on offer at their first permanent site, if you're there in the morning. But lunchtime at Yolk's about the sandwich. Sort of cocky to call them Ultimate Sandwiches on the menu - but when it comes to the Umami Chicken, we can't argue. A stack of chicken, pickled daikon, avocado, secret hot sauce and kewpie mayo, stuffed in generous amounts into a flour-dusty ciabatta. It might be the single messiest thing we've ever eaten at our desks, and it's up against some stiff competition there. Colleagues stared in silent, polite horror. Worth it. Yolk, Finsbury Avenue Square, EC2M 2PG.